Welcome to my bear page. As you scroll thru these images please be aware that I used a Nikon 500mm telephoto lens with a Nikon D850 camera. Most of these images were taken at ISO 4000 and a few at ISO 5000 with shutter speeds at 1/80 to 1/250. They were taken at dusk or dawn. At no time did I disturb the bears or get within 50 yards of them. Sure, they saw me but sometimes that was all and they left quickly and sometimes they wandered off feeling I was as of no threat. I also had permission to be on the property. Enjoy the bears and please DO NOT FEED BEARS ! 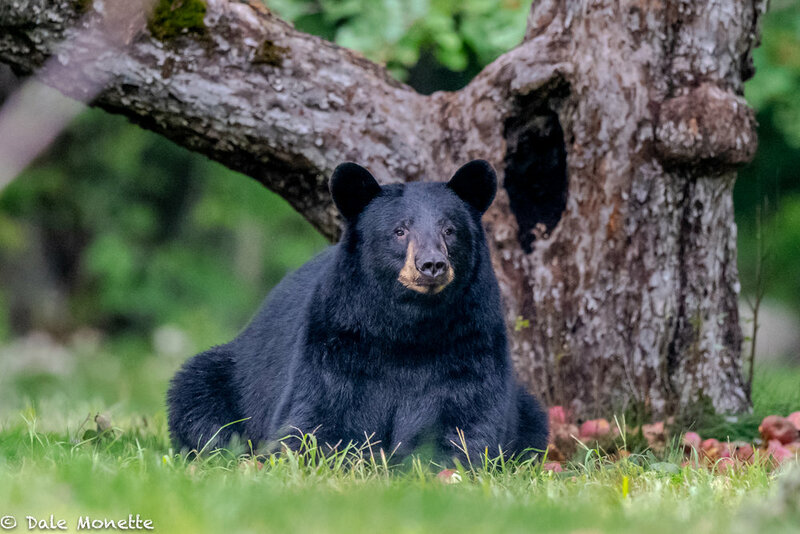 The same bear as in the last image…As you can see here, black bears love apples. This bear found the mother lode ! A black bear can eat a bushel (46 pounds) in one setting. I’d puke !! This female bear has 2 cubs with her….. she was suspicious of me even though I was almost 150 yards away…..notice the cub on the left hand side of the image just peeking out of the woods. Even though she was about 75 yards away, and my Nikon D850 shutter was set on the silent mode, she still heard it click when I took this image and abruptly left with both cubs running behind. The 2 cubs bobbing for apples in the grass ? On another evening about dusk I spotted the same sow with her 2 cubs walk out of the woods by this tractor used for mowing. The cubs spent a few minutes walking all over it. I don’t think they had ever seen one. The 2 cubs were slowly creeping out of the woods into the orchard, then they would grab an apple and then go crashing into the woods as fast as they could run. Five minutes later, the same thing. What a laugh to watch. I saw this a few evenings. Planning the attack on those pesky, delicious apples ! This small bear was after apples. I was about 175 yards away from him when he appeared. He spotted me behind the wall and in the woods but the power of the apples overpowered him and he must have figured I wasn't a threat and carried out his plan. “I sure would like one of those juicy apples” He was still suspicious of me but finally decided the apples were worth the risk and I wasn't a threat. This bear walked out right in front of me one evening and started sniffing the air. Researcher say a bear can smell a piece of chicken grilling from 5 miles away. Their sense of smell is 7 times that of a blood hound. Within 15 seconds it shot into the woods like lightning. 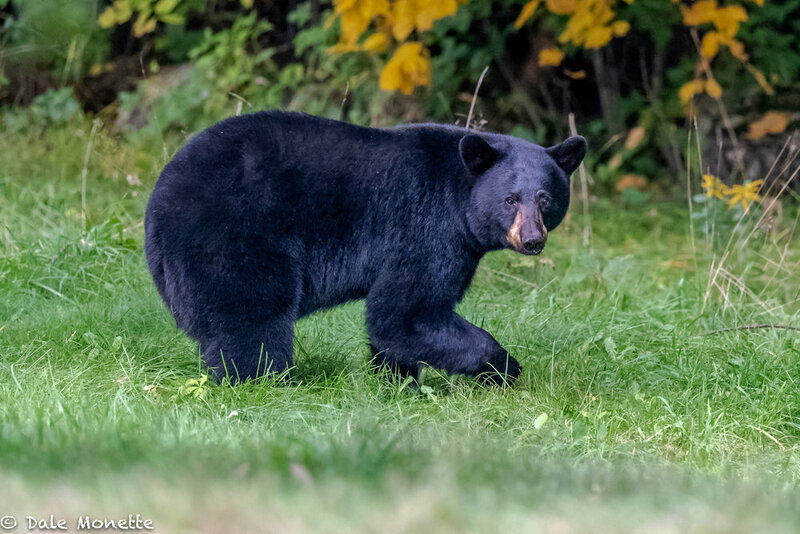 Black bears are very timid and skittish creatures. When I did see them run I was amazed how fast they could go. They can run up to 35 mph in short bursts. A wet, soggy, hungry black bear walked out in front of where I was setting in the woods on the edge of a big field getting soaked. I’ve seen him a few times and nothing seems to excite him, the look he gave me when he discovered I was behind him says it all. This large bear is zeroing in on a pile of apples that have fallen and thinking what a find ! Unfortunately this bear couldn’t hide behind this tree ! Here is one of the cubs that was with its mother this morning. Notice the size of the feet and a MassWildlife ID tag in the left ear. This female bear had 2 cubs with her when I spotted them making their way through the woods. I set up on a nearby wall and waited for them to appear…. she was a little suspicious and finally left with the cubs in tow. Notice the cub peeking out of the woods on the left if the image?